5 D Motion Ride : It’s the real deal. Come one, come all! 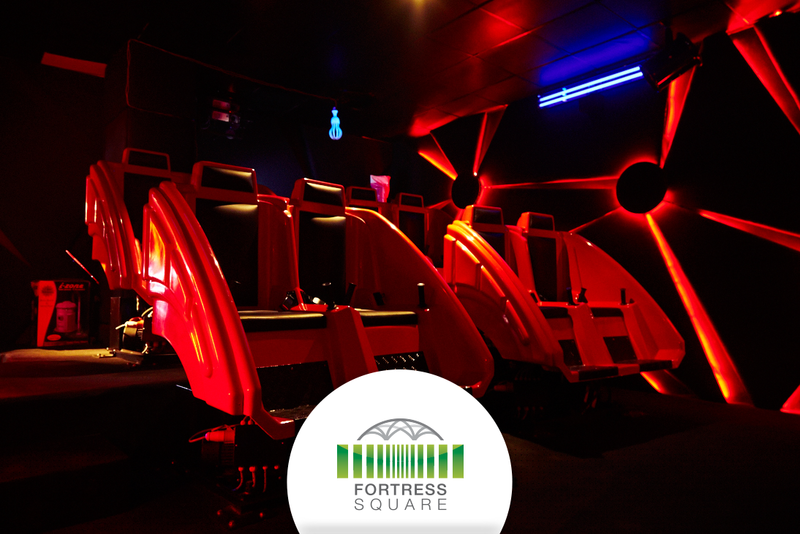 Visit us to experience our star attraction and pick from our choice of 6 adventures – Rollercoaster, Great Wall of China, Canyon Twister, Haunted Mine Ride. Ravine Racer and Bloody Road. The fun doesn’t stop here. We have action packed arcade games such as rail shooting which is really hard to resist (even for adults)! We haven’t forgotten the little ones! Alongwith some fun redemption games, that let you play to win a prize, we also have a Carousel and Pirate Ship. You can also enjoy the Food Court if you exit from the upper floor of Super Space for a really fun family day out! Reasonably priced so that everyone can have a good time. Always expect more fun from Fortress Square! At Lahore’s Biggest Mall we always think of the little ones. 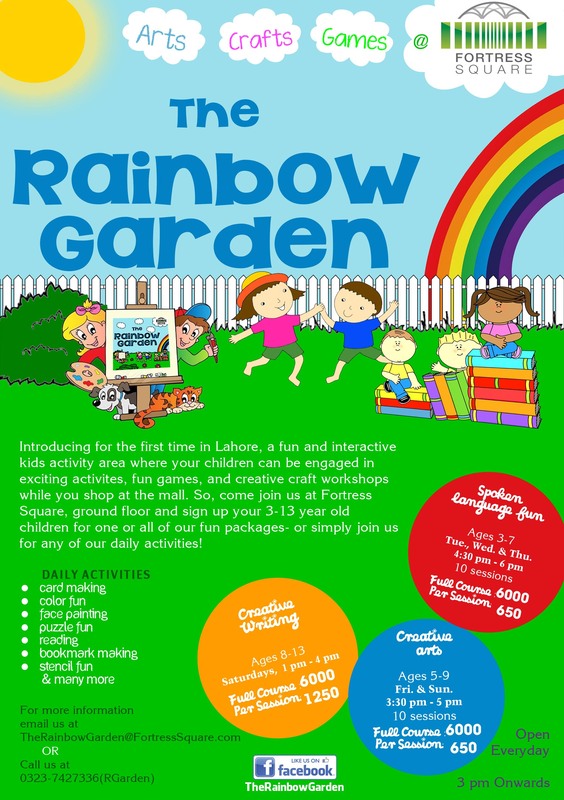 Rainbow Garden is our Kids Club that caters to 3 – 13 year olds. There are a variety of packages as well as daily activities for different age groups to keep kids engaged while you shop! Our packages are a fun way for kids to brush up on their spoken language skills, arts or creative writing! We offer partial as well as full sessions for you to choose from. Our daily do’s include painting, crafts for kids as well as some puzzles and reading that involve logic and fun! 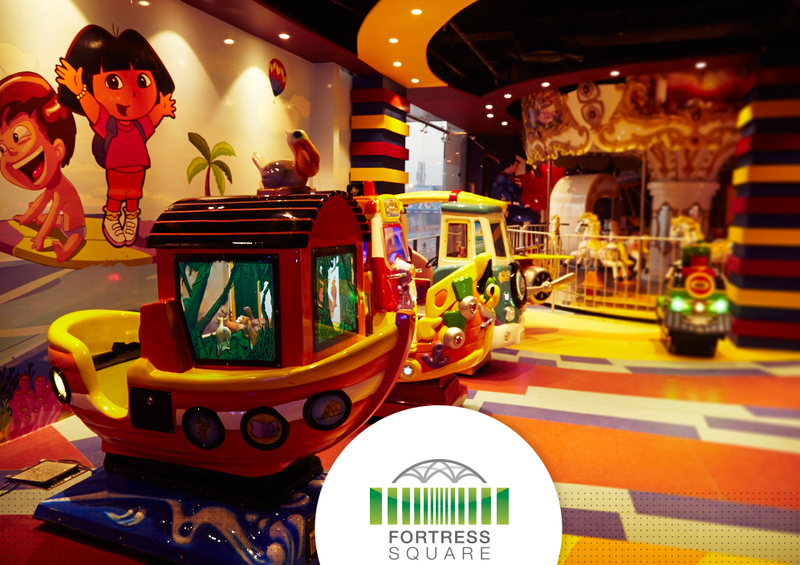 To join us and for more information, email us at Therainbowgarden@fortresssquare.com or call us at 0323 7427336. 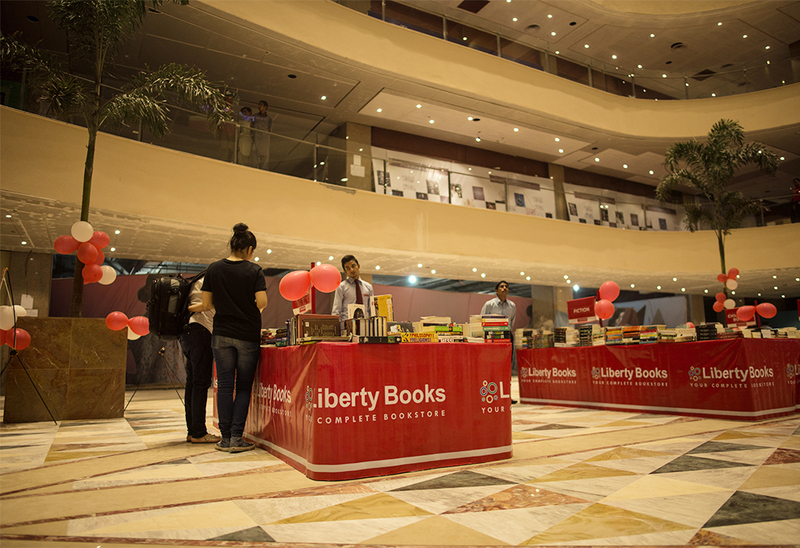 In collaboration with Liberty Books, we are currently holding an amazing Book Fair with over 1000 books on sale! It’s always fun to spend an afternoon browsing through books and an amazing feeling when you find something to take home with you. 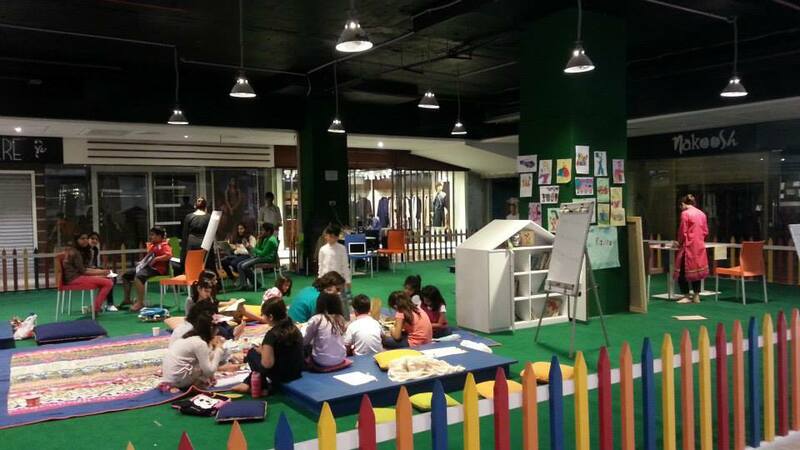 The best part is that there is something for everyone at Lahore’s biggest mall – genres include comics, fiction, nonfiction, novels in English and Urdu, short stories. The bestsellers so far are fiction – let’s see if things change this weekend. The sale ends on 14th September so come spend some time with us this weekend. Our top 4 shopaholic celebrities seem to all be women though. Read on and make up your own mind! The pop princess infamously declared, “I can be in the dump of dumpsters and go buy a pair of new shoes, and then it’s okay.” Although we can’t agree that money can buy happiness, it can certainly provide distraction and comfort to some degree. After her parents split, she bought a $20,000 bed and $4.5million estate for her mother. Spears prefers to get her fix of designer apparel online and we don’t really blame her when hordes of paparazzi stalk her in real life, recently even making a big deal out of her grocery shopping list. Given Rihanna’s “Fashion Icon” status, it’s no surprise that the stylish star is a lover of shopping. She has been known to drop $20k on a single shopping trip, Rihanna is most definitely not a designer snob — she recently revealed to Vogue that she likes to shop fake jewelry from Claire’s, or her mother’s ‘FAB-U-LUS’ boutique in Barbados. Even when the loyal Birkin fan already has a Birkin collection worth about $2 million, Posh Spice still needs more. On a trip to Milan, besides shoes, dresses, luggage and 12 pairs of sunglasses, she also bought five sofas, perhaps to fill up some space in her 22 acres home! The star of ‘Keeping up with the Kardashians’ is possibly the most well known shopaholic out there! Documented incidents such as Kanye West helping her clean out her entire closet and then getting it all replaced with even more designer wares (thanks to her man) — if that isn’t a sign of being a shopaholic, then we don’t know what is! The socialite and her mother were also spotted in Paris together, shopping in the exclusive Hermes boutique. Together, they hauled a total of 7 bags, with 6 bags being the widely-coveted status symbol Birkin. The last bag was a rare crocodile skin purse which was priced at a cool $30,000. If you remain unimpressed, wait till you hear about Victoria Beckham’s collection. What’s Happening at Fortress Square? This leads us to the BIG question: When are we launching? Who all is going to be there? Ans: All the BIG brands you want to see – in fact over a 100 of them making Fortress Square the BIGGEST one stop lifestyle destination in Lahore! Our slogan “1 MALL , 100 BRANDS” is a reality in the future. With exclusive international brands and local showstoppers already setting up shops at our premises we are days away from announcing our launch date! 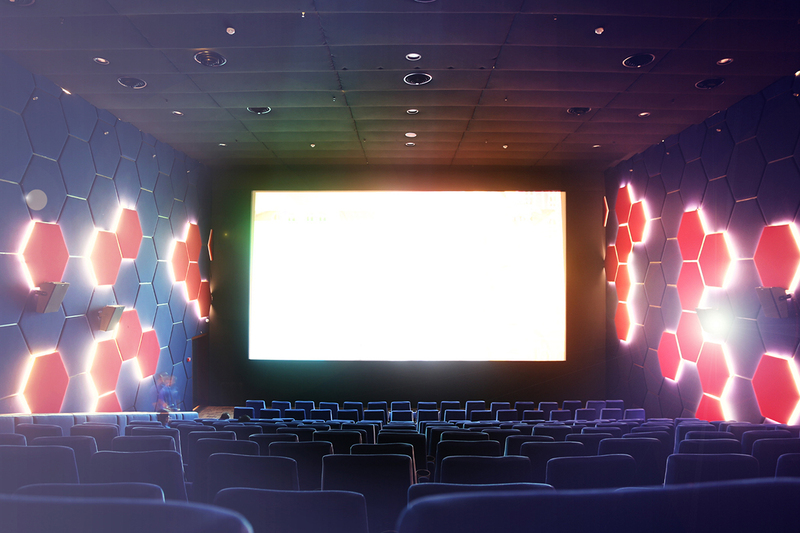 The multi-screen Cinepax , equipped with the revolutionary Dolby Atmos sound technology has already opened its gates for Lahore. 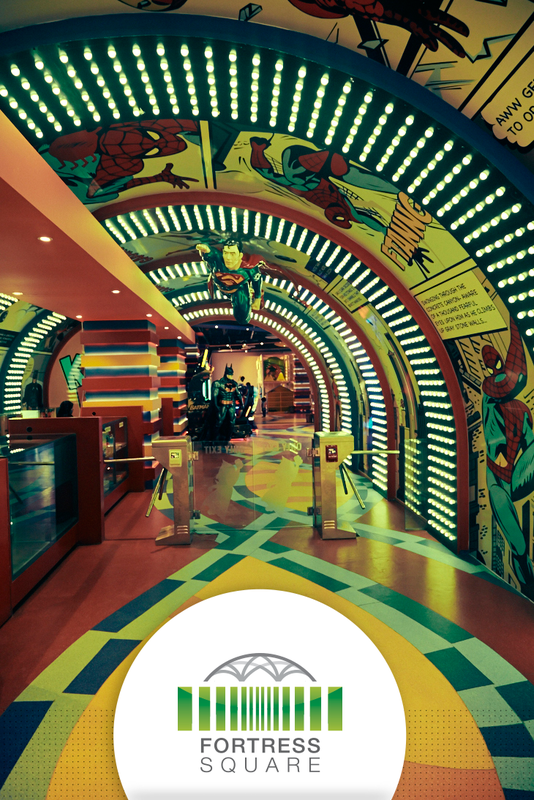 The Food Court and Super Space (play area for kids) will be up and running soon!